Donkeys in Kenya lined up for slaughter. 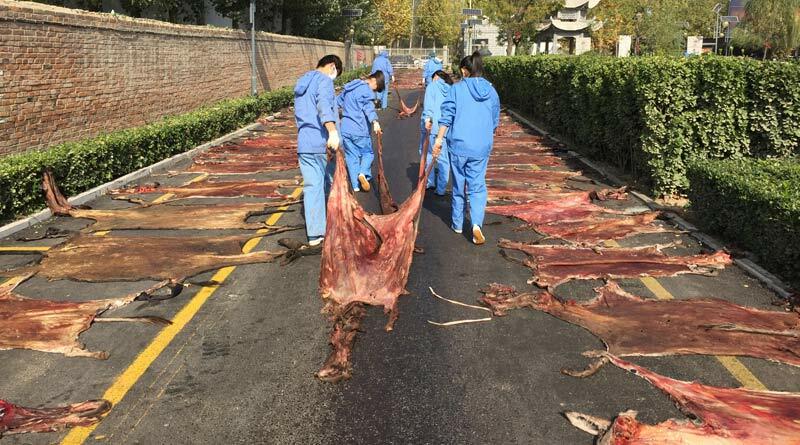 China’s official National Health and Family Planning Commission has advised consumers that a popular health product, made from millions of slaughtered donkeys every year, is “not worth buying” and despite its many health claims is “just boiled donkey skin”. The news has been welcomed by international animal welfare charity, The Donkey Sanctuary, which has been campaigning for a halt to the global trade in donkey skins. China’s official National Health and Family Planning Commission post on ejiao. On a post on Weibo (China’s version of Twitter) on Sunday, February 18,the Commission, which operates the official 12320 medical advice and information hotline, tweeted that the product, called ejiao, is “… not a good source of protein” and that its health claims were at best overstated. The Donkey Sanctuary has been campaigning for a halt to the global trade in donkey skins, which uses about four million donkey skins every year. It is estimated that as many as 2.2 million skins are imported to China from Africa, South America and parts of Asia every year. Over the past two years, an escalating demand for skins to make the product has also resulted in poaching and theft of donkeys from individuals and communities that depend on them, with national donkey populations being halved in some countries. Many social media users in China shared the Commission’s original posts, others of which said that medical claims or benefits for traditional remedies made from sea cucumber and bird’s nests were also overstated or unverified. However within a few hours the Weibo feeds for all of the Commission’s tweets (@全国卫生12320) had mysteriously gone offline and remains offline now. Alex Mayers, head of programmes at The Donkey Sanctuary, has been working at ground-level with partners around the globe to expose the donkey skin trade to protect donkeys and the communities that rely on them. “A huge number of medical claims are made for ejiao, and despite its high price, it’s an extremely sought-after and popular product. This advice from the Commission has resulted in a lot of discussion on social media in China, both about the claims and benefits of the product and also about it having seemingly been deleted. #12320 Health # [Festival is not worth buying Ejiao] Ejiao paragraph in health care products has been high, there are a variety of effects aura blessing: blood, bleeding, beauty, tocolysis, anti-fatigue, anti-cancer However, through the phenomenon Look at the essence, Ejiao just“ boiled donkey skin”. Donkey skin is the main component of collagen, the lack of protein, the body of tryptophan, is not a good source of protein. ← Equitation science: Does it baffle too many horse owners? No más maltrato animal. Pónganse en el lugar de esos animalitos.